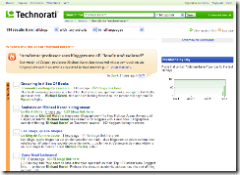 3 posts categorized "Blog Search"
Technorati - where has the "Sort by Authority" gone for search results? Am I missing something? Prior to Technorati's recent redesign, I was rather sure that there was a way to sort your search results by "Authority".... I seem to recall using the feature many times to find out who were the most "authoritative" bloggers talking about a particular topic. While Technorati's Authority measure isn't perfect, it does at least give some sense of how popular a given blog is. Sorting the search results by authority gave you a sense of which blogs to perhaps take a look at first. I am, however, questioning my own memory - was this feature there before the redesign? Or did I just imagine it? Today, post-re-design, I can't for the life of me find that ability in any of the search results. Yes, I can filter the results based on authority (i.e. specify the amount of authority to be returned: "any", "a little", "some", "a lot") which can help, but I can't seem to find any way to re-order the search results. I get them in reverse chronological order (newest first). Period. End of story. Am I missing something? Or is there no way to do this in Technorati? First, we've eliminated search silos on Technorati. In the past, you had to know the difference between keyword search, tag search and blog directory search in order to make use of the full power of our site. No more. Starting today, we now provide you a simplified experience. Simply indicate what's of interest to you and we'll assemble the freshest, hottest, most current social media from across the Live Web - Blogs, posts, photos, videos, podcasts, events, and more. But what if I want the search silos? Specifically, what if I want to search for posts tagged with a given tag? Yes, that's still available on the Advanced Search page and yes, I can create a URL like http://technorati.com/tag/voip and use that... but I guess you can count me as one who liked the aspect of the old interface where you could choose to just search on tags. Well, searching on posts by tag represents a richer way to search for me. Searching for a string in blog posts pulls up all sorts of things (and can be very difficult to sort through if you are searching for a generic text string), but searching for a tag gets into the author's intent. The author did more than just write about something, they tagged it to indicate that it had some relevance to that category. It also, quite frankly, provided a way to separate out the absolutely clueless newbie bloggers from those who have a clue about blogging and applying meta-information to their entries. Tags are not perfect... spammers certainly tag their entries with all sorts of irrelevant tags which pollute search results... but they are one additional way to aid us in sorting through the huge volume of information posted to the blogosphere. So I use tag searches all the time, and it was easy to just go to technorati.com, enter in text and change the option box to a tag search. Now, that option seems to be gone and I have to either do one more click to the Advanced Search (easy to bookmark and use from my systems, but not as quick when I'm elsewhere and need some info) or construct the appropriate URLs. Technorati team, for those of us who love tag searches, how about giving us a "tag.technorati.com" that will let us search by tag? Other than that, the refresh looks quite nice - kudos to the team for making it happen. Owning the #1 Technorati search result through using the new WTF feature! How would you like your text and a link to your blog(s) to show up at the very top of a Technorati search as the #1 result? As shown in the picture to the right, I just did that. 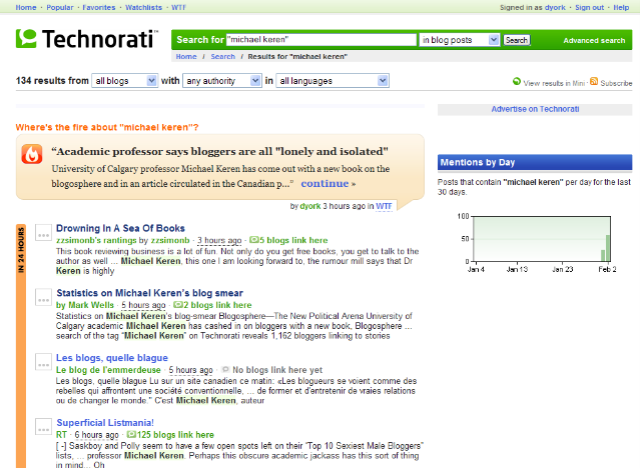 If you do a Technorati search on "Michael Keren", with or without quotes around his name, you wind up with a screen like the one I've shown, and right up on top is a peach-ish/tan-ish box with a flame next to it that has a headline, some text and a link to my Technorati profile. I just put that up there a few minutes ago. Ever wonder why something is sooooo popular? Why are the hot topics hot? WTFs explain the buzz around people, things, and events. Who writes these WTFs? You do! Anyone can write one on any topic, and everyone can vote for the best explanations. The ones with the most votes rise up and the dreck sinks. Let millions of other people benefit from your genius… no blog required! Here at Technorati HQ, we know that we're taking a pretty risky step - we're putting our highest-value real estate - the topmost search result - in the hands of our community. This is a big social experiment to see if people will work together to help create something great and useful, and will use the voting system to push up the best explanations to the top. Exxon Mobil is a sleazy oil company that announced a quarterly profit of $39.5 billion which works out to a *profit* of $4.5 million dollars *per hour*, while the US Senate is debating whether the minimum wage should be bumped up to $7/hour. Bald black-wearing blogger from "beautiful Montreal" with tons of groupies who raves about Second Life and pronounces "image" a funny way. I don't know what happens if Mitch then posts a WTF blurb of his own and both have no votes. Does the latest blurb win? So the question is - will bloggers in search of links go through and populate Technorati with WTF blurbs that might get people to view their Technorati profile and then their blog? Will we see "fights" to determine whose blurb gets on top? How long will it be until unethical people start WTF-spamming to drive links to their profile and blogs? Interestingly, there doesn't seem to yet be an overly easy way to monitor if there is a "WTF" blurb written for your company... obviously you can look at the page for your search. If there is already at least 1 blurb, you can monitor the URL "www.technorati.com/wtf/<name>", as in http://www.technorati.com/wtf/michael-keren, but it's not clear to me that there is yet an automated way to do this (like an RSS feed). Non-English readers may not realize that "WTF" is also translated in at least American slang as "What The F___?" with the commonly used profanity that sounds a lot like "duck" (as Dan continues to try to keep his blog work-safe).